Picture of the Ontario Legislative Building, set in a large urban park named Queen's Park in central Toronto. The building is a fine example of Richardsonian Romanesque architecture. Many laws have been debated, approved, and/or rejected within the walls of this stunning building set in the middle of Queen's Park. 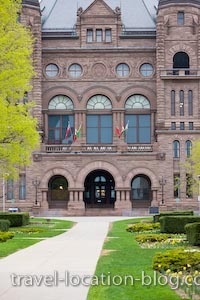 Built between 1886 and 1892, the Ontario Legislative building was subjected to a fire in 1909 which destroyed the west wing. It was rebuilt however, it's styling varies from the original style of the East wing. Ontario Legislative Building (1892) in the city of Toronto, Ontario, Canada.